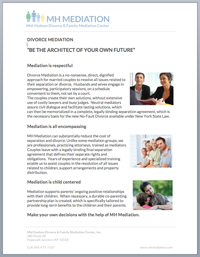 If you have a business disagreement or a conflict in your organization, large or small, MH Mediation can help. We enable you to maintain successful business relationships, and solve problems with amicable solutions, using less-costly, less stressful proven tools. You maintain control, since you make all the decisions. You may have heard the phrase, “cooler heads prevailed” — we facilitate calm, reasonable discussions that lead you to solutions. If you have a major decision that needs to be discussed by a number of stakeholders in your business, we can provide guidance in structuring the process and can provide facilitation services to help you explore possible solutions or approaches to whatever issue you are confronting. We handle large group facilitation, multi-party mediation, partnership negotiations, as well as dissolutions, employment disputes, construction problems, and breaches of contract. Any business problem can be mediated, if the parties will agree to try mediation.